The two new tanks, reassembled adjacent to the car park ready for lifting. This view shows very clearly how the profile of the inside sheets is much more complex than that of the flat outside sheets. 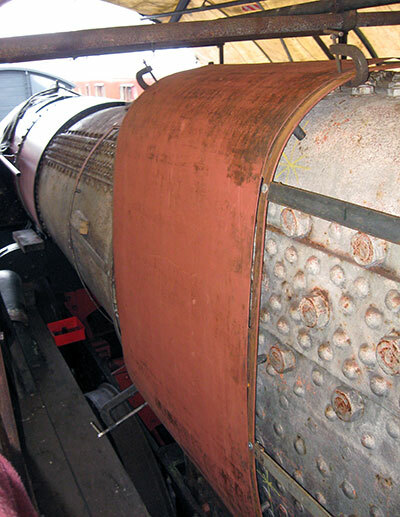 The vertical profile mirrors the lower half of the boiler, and the longitudinal profile has a set in it to clear the firebox corners. Photo: John Whitcomb. 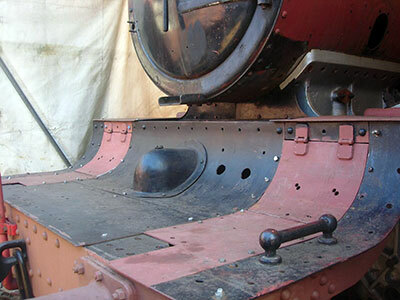 The new sections of front footplating have been re-profiled to the correct radius. Photo: Tony Summerton. 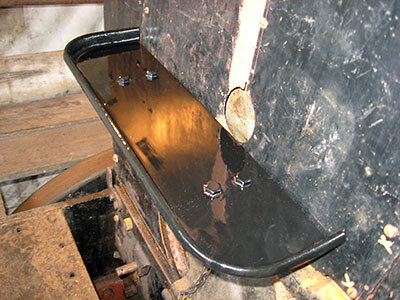 The oil tray, better known for keeping tea cans hot, in black gloss. The backhead cladding behind it will need to be finished to the same standard! Photo: John Whitcomb. 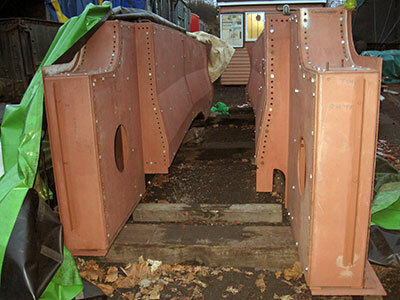 One of the firebox cladding sheets attached temporarily. The orange finish at the top is not rust fortunately, just grease from the rollers. Photo: John Whitcomb. 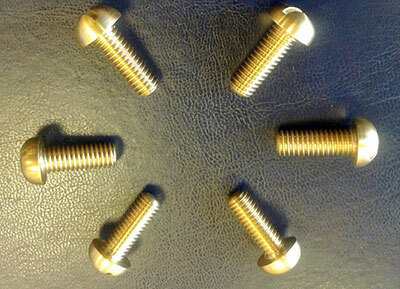 A new set of large dome-headed brass screws for securing the safety valve bonnet to its mounting plate under the boiler cladding, machined in our Wiltshire outpost. Photo: Alan Baines. The left hand side of the new bunker in Bewdley Goods Shed, with steps and handrails attached. 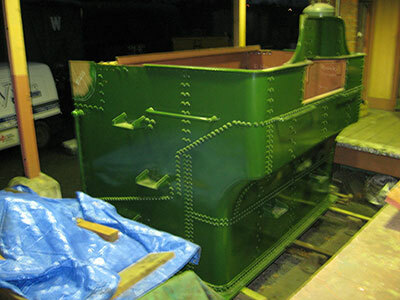 The missing section at the back will be installed once the bunker is bolted down on the loco frames and the upper coal plate is welded in. Photo: John Whitcomb.